Advocating for teacher stewardship of green, healthy, and sustainable schools. What makes you feel like an effective teacher? What is it about where you work -- or how you work -- that makes you effective? I often feel effective as a teacher at Science Leadership Academy (SLA) because of my working conditions. I have a lot of bright and thoughtful colleagues, well-organized classroom resources (paper, printers, markers, warmth, lab materials, etc. ), energetic and curious students, and a supportive administration. I have opportunities to collaborate with colleagues and co-plan curriculum, programs, and our professional development. All of these wonderful elements create a platform for consistent effectiveness, whether over a 9-week period, or within a short 10 minutes. Below is an example of 10 minutes that were especially productive. Earlier this quarter, I worked with "KM," one of our 9th grade science students who hasn't had a lot of experience with writing or organizing. By using a collaboratively-developed lab proposal process, KM has been able to develop his exciting ideas about science, and then make them more concrete through structured coaching, encouragement, and direct experience in the lab. KM has been able to identify and describe an unexplained event, develop a hypothesis and procedures, and then experiment to find out more about his questions. The 10-minutes I spent with KM in September carried him through October and November. Each time that I've worked with KM since September, his inquiry has become deeper and his knowledge is more thorough. KM now visits my classroom during his free period to work with other 9th graders. KM could have easily become frustrated and lost in the mix, but because of his persistence and my availability, he is engaged and enthusiastic about learning. These 10 minutes have been so effective because of the explicit commitment from colleagues within the science division to develop a common language around lab proposals (and lab write-ups). Our discussions and deliberations over the last few years have really helped me to refine and enrich my understandings about what student need in relation to the philosophy and process of science. The professional collaboration at SLA has provided the context and support for me to be more effective. It's also nice to have a functioning lab -- with running water(!) -- that is attached to the traditional classroom space. So what makes you feel like an effective teacher? What is it about where you work -- or how you work -- that makes you effective? As you may know, we just published a report of teachers' effective working conditions. 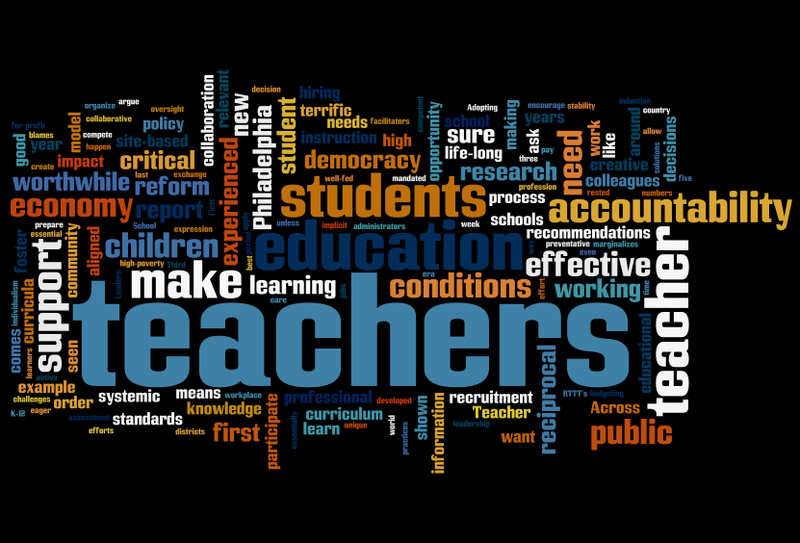 I then dumped some of the text into Wordle, a fun, word-clouds type graphic arts program. Try it, you'll like it! Unions should serve as advocates for 1) effective working conditions and 2) worthwhile education. 2) Healthier lunch choices, regardless of school size or vendor contracts. 3) Full-time nurses in each school, every day of the week. Think of the opportunities for "wellness studies" link to science, physical education, social studies and electives. 4) Re-negotiated school calendar that emphasizes time for civic engagement, family time, rest and recreation. Why in the world are children off on Election Day when their parents and teachers are working? How can we re-organize our school calendar so that families have more time to be together? And let's recognize an Indigenous People's Day. 5) Site-based decision-making with regard to hiring, budgeting and curriculum choices. Let's emphasize students' love of learning, collaborating and presenting rather than isolated content. Make district-wide curricula optional and collaborative. 6) Flexible site-based scheduling that emphasizes teachers' co-planning and reflection. What do teachers unions look like where you're from? What can we do to help our unions be advocates for worthwhile education? As a parent, I want engaging learning experiences for my daughter. As a citizen, I think education should foster and model democracy. Teacher Recruitment: The teacher residency is a good model for recruitment and support of teacher candidates because it aligns college, district and community policy around student needs. Accountability: Assessment and evaluation systems for students and teachers need to be reciprocal, broad and holistic. Life-long Learning: Teachers are more effective with the development of professional networks within and across schools to support teaching and learning. Teacher Leadership: Teachers need diverse opportunities for teacher leadership that do not require removal from the classroom. Social Capital: As a society, we need to invest in community resources to develop and support effective schools. Children who are safe, healthy and well-rested are more likely to do well in school. 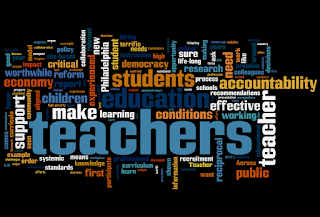 What do you think are the working conditions teachers need in order to be effective?